You're not going to want to leave your college dorm room walls bare. They're a pretty bland and plain off white color that won't add to your dorm room decor. In fact, it will do a bit of the opposite and detract from your dorm room decor! Plus leaving your college dorm room walls bare will do the exact opposite of what your goal is with your dorm room decorations. Those college dorm room walls are going to make your college dorm room feel less like home instead of more like home. You spend a lot of time coming up with your college dorm checklist - as you're adding dorm essentials, make sure you consider some great college wall decor that makes your college dorm room feel more like home. Our Achilles College Poster is a beautiful and pretty cool looking dorm poster to have in your dorm essentials. This dorm necessities item features a bird outlined in blue which looks pretty stunning on its own. 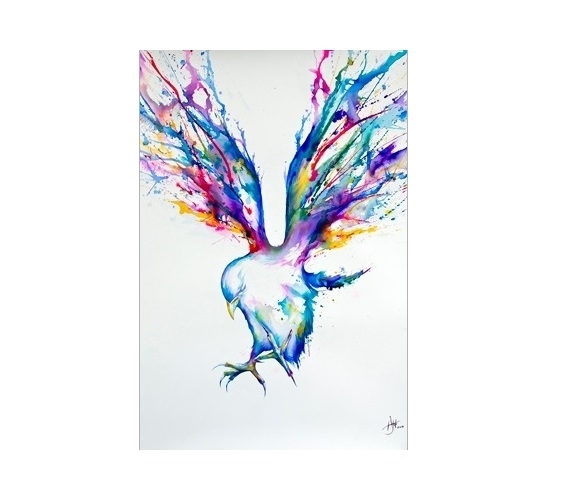 The wings of the bird are spread out with multi-colored paint splatters for a super cool effect that will add some amazing dorm room decoration to dorm room decor. On a white backdrop, the effect of this college supplies item is simple yet stunning. This incredibly beautiful and eye catching dorm necessities item will be one your friends won't be able to look away from!